From the Uchida Publisher Archives - We were fortunate to purchase a wonderful collection of 20th century prints directly from the archives of the Uchida Art Company of Kyoto. 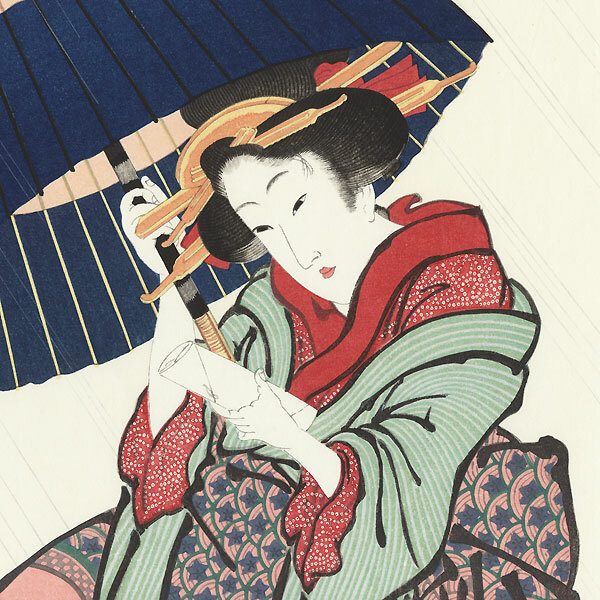 The classic 20th century prints offered in our auction from this collection are all first edition prints of various designs released by the Uchida company in the mid-20th century. These first edition prints are unusual to come by in a nice group as they were generally sold off as they were produced. This excellent collection was held back and recently sold from the Uchida archives. These prints are a nice opportunity to collect a lovely 20th century print, or perfect as reasonably priced gifts. Don't miss out on these prints, once they sell out, we won't have them again! 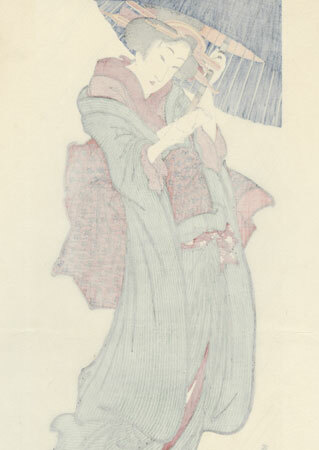 Comments - Beautiful Eizan design of a beauty caught in a rain shower. 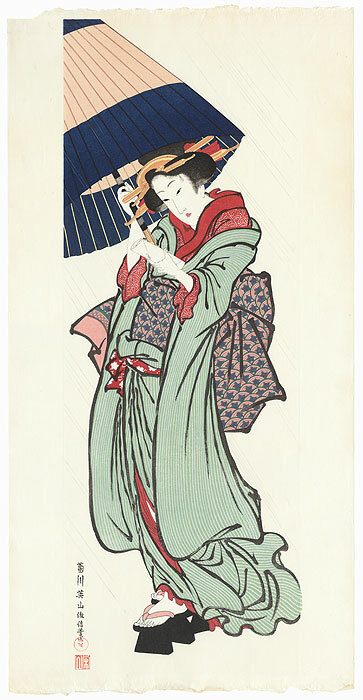 She holds a partially closed umbrella around her head as raindrops slant past, a letter in her hand. Her outer kimono is patterned with soft green stripes, worn over a red tie-dyed under robe. Wonderful calligraphic strokes outline the edges and folds of the garments, contrasting beautifully with the fine designs in the fabric. A lovely, extra-large format print with attractive color, and a great choice for display. Please note: due to the size of this print, it will be shipped rolled. Condition - This print with excellent color and detail, as shown. Slight toning, a few small marks and creases. Please see photos for details. Good overall.